Fall is one of the most wonderful times of the year. The summer heat starts to die down, the leaves start to change colors, and one of the most universally loved holidays is just around the corner – Halloween. Whether it’s the spooky stories, horror movie marathons or endless cornucopia of sweets, there is truly something for everyone to enjoy about Halloween. 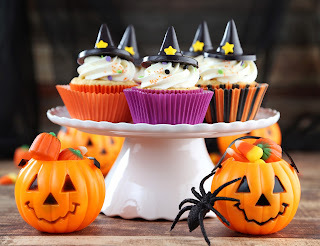 Below are a few delicious ways to help make your Halloween get-together with friends and family as sweet as possible. Cookies and cakes are always a crowd pleaser. But with Halloween on the horizon, there is endless opportunity for creativity. So why not get into the spooky spirit and bake up some cakes in a themed form pan like this bat-shaped baking form or this coffin-shaped pan. Just make your favorite boxed cake and allow one of these uniquely shaped pans turn it into a truly creepy confection for all your guests to enjoy. Halloween is one of the only times of the year when people get to truly express their creativity with some wild and zany costumes. Why not combine two of the best parts of Halloween, costumes and candy, by letting your guests use your sweets as part of their costumes! These face mask molds will let you create a delectable disguise for your guests, while these vampire teeth chocolate molds will satisfy every sweet tooth in your group. Fondant is probably one of the most versatile ingredients you can have in your baking arsenal. This type of icing takes your cake decorating to the next level and gives you the opportunity to add a truly personal touch to anything you bake. Whether it’s a regular cake with some fun designs on top or a truly out-of-this-world cake ball creation, fondant lets your imagination run wild. Because it’s Halloween, you’re going to have to put a creative spin on how you offer up these sweet treats to your friends and family. Try wrapping candy up so that it looks like a mummy before giving it to your guests. By using something as simple as crepe paper streamers to wrap up your candy, you can create a mummy illusion for your guests that doubles as a truly memorable party favor. Finally, Halloween would not be Halloween without some good old-fashioned fake blood. With something as simple as a candy writer, you can make any baked good look like its oozing and bleeding all over the dessert tray. This illusion is so simple and easy to create yet has such a huge payoff. Your guests will be so impressed with your creativity and attention to detail and will no doubt be back for more next year.